I am Muhil, Chief Curator of Join ELM. offers you a daily ritual to handle your keys in an enjoyable way. holds your phone, which is a surprising feature. It is a small piece of luxury to have everything organized in a beautiful material. If you can connect with her inspiration, then you should go ahead and buy it!! Since it is special we don’t make lot of them…hurry!!! Product serves dual purpose. It organizes your keys and also act as phone holder for you to watch videos hands free. Watch videos hands free – Ideal product for classy travelers. Go hands free while watching a video with your phone! Better organize keys – No more clinging keys. Naturally Tanned Premium Leather – Leather used in the process uses traditional leather processing techniques. This techniques produces premium leather whose value and feel increases with time. 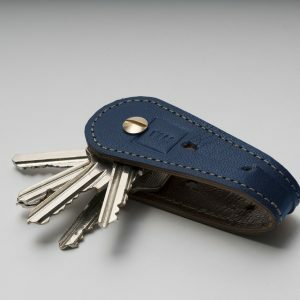 Dual color option – Key holder works either ways. It is up to you to choose if you want blue on outside or to have the cognac!